Transform extremely damaged hair with René Furterer Absolue Keratine Ultimate Renewal Mask, a deeply restorative, ultra-concentrated hair mask that provides intense nourishment to leave hair with improved strength, softness and resistance. Specially formulated to help intensely repair damaged, brittle hair, the rich hair treatment regenerates and rejuvenates to leave dull, tangled locks looking soft, supple and radiant. It contains extracts of Camelina and Plant Keratin to help soften and reconstruct hair, plus a dose of fatty acid and ceramide-rich Biocymentine. The intense mask will improve hair's manageability and appearance. 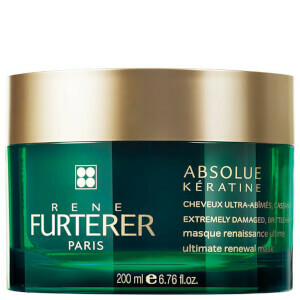 Suitable for extremely damaged, brittle hair. Apply to the ends of towel-dried hair. Leave for eight minutes. Comb through and rinse.